Go to Google Suggest or Yahoo! Answers and you'll find tons of people asking queries like 'how to say [insert word here] in multiple languages.' 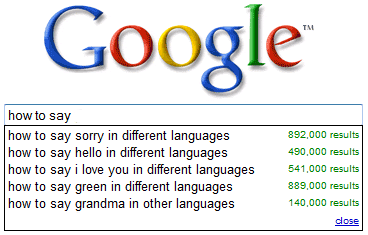 People want to know how to say Sorry, Hello, Love, Grandma and even the color Green in different languages.�Go to Google Suggest or Yahoo! Answers and you�ll find tons of people asking queries like "how to say [insert word here] in multiple languages." If you would also like to know how a particular word (or sentence) should we written in multiple languages, Nice Translator should help. This is Google Translation powered tool where you select a group of languages from the drop-down and it will translate whatever you type in different languages all at once. Nice Translator uses the auto-detection option of Google Translate API so don�t even need to specify the source language. Type the first sentence in English and the next one in German or Hindi and the tool will easily detect that language change.